The groundwork for the Jaguars’ breakthrough—and the difference from January to September—was laid in a coaches meeting on Thursday. This is the time of week when coach Doug Marrone charts the game-day course for his assistants, and it was clear to offensive coordinator Nathaniel Hackett coming out of last week’s meeting what that course was. “He always has a plan for us, how to beat each team, what he thinks we need to do,” said Hackett from a jubilant postgame locker room. “Coach Marrone talked about if we potentially got into a four-minute situation, how he wanted me to handle it. And he gave me the green light—he gave me the green light to do whatever I want. Marrone knew as much, of course. He also knew that green light ran counter to how last season ended for the Jaguars, which was exactly the point. In the AFC Championship Game in January, Jacksonville lost to these Patriots after going for the jugular for three quarters and building a double-digit lead, only to revert to the football equivalent of playing four corners and blow the game in the final 10 minutes. It was easy in the aftermath for the Jaguars and their coaches to vow it wouldn’t happen again. It’s harder to actually change. But Marrone did, and Hackett didn’t need to be asked twice to sign up for it. The four-minute situation arrived with 3:28 left in the fourth quarter on Sunday and the Patriots having cut the Jags’ lead to 31-20. Dede Westbrook had just been dropped for a 6-yard loss on the first play of the next possession, and that left Jacksonville in second-and-16. The conventional call in that situation would be, of course, to hand the ball off twice, force Bill Belichick to spend his last two timeouts, and punt. There would be none of that. Bortles found Paul for 22 yards. The Patriots never got the ball back. Final: Jaguars 31, Patriots 20. Bortles: 29-45, 377 yards, four TDs, one INT. Upshot: If the Jaguars get quarterbacking like this, they can be positively scary. Avoid the lag! 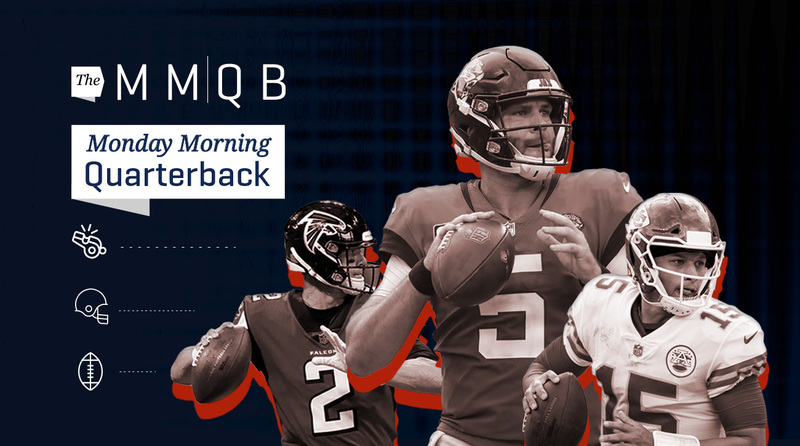 If you want the latest episode of The Monday Morning NFL Podcast in your feed when you wake up Monday morning, subscribe to The MMQB Podcasts. • Kickers coming into play again, costing the Browns bigtime for the second week in a row and the Vikings in a game that could well be the difference, for both Minnesota and Green, between a No. 1 or No. 2 seed and a No. 5 or No. 6 seed. • Speaking of costing the Browns, Cleveland went to Sunday’s game hours after the announcement that the team was letting Josh Gordon go. • Ryan Fitzpatrick’s second consecutive 400-yard, four-touchdown effort—this one against the world champion Eagles—with one game left in Buccaneer starter Jameis Winston’s suspension. • Matt Ryan and the Atlanta offense coming alive to outgun Cam Newton and company and keep pace with those division-leading Buccaneers. • The Giants offensive line, even with expensive left tackle acquisition Nate Solder and second-round pick Will Hernandez in the lineup, still struggling mightily. • The Broncos and Dolphins moving to 2-0, joining the surprising Bengals after Cincy’s Thursday night AFC North win over the Ravens. • The Bills and Cardinals seemingly circling the drain, so much so that one Buffalo player decided to up and retire during halftime of Sunday’s loss to the Chargers. To me, though, there’s no more compelling story from the Week 2 slate than the Jaguars slaying the demons of Januarys past at TIAA Bank Field, and doing so by not hiding, but rallying behind the quarterback they swore to everyone they still believe in, whether or not anyone else does. Albert Breer breaks down a critical factor in the Seahawks-Bears Monday night game. While others wondered if the Jags would trade for Alex Smith, or try to clear cap room for Kirk Cousins, or draft Lamar Jackson, the team was busy hammering out a three-year, $54 million contract to keep Bortles, the No. 3 overall pick of the 2014 draft, in town. And Hackett’s feelings about the quarterback mirrored those across the organization. Bortles, the Jacksonville brass believed, was never really given a fair shot. Despite being seen universally as raw coming out of Central Florida, he was starting four games into his career and had three different offensive coordinators in his first three NFL seasons. As Hackett saw it, Bortles was just going out and playing football at that point, rather than playing quarterback. It would take time to go from the former to the latter. That’s what Hackett and Bortles have been working on since Hackett got the coordinator’s job full-time in January 2017. Last year the focus was on Bortles controlling his urge to take shots, accepting the checkdown more often, and using his legs more effectively. This year they’re working the shots back in, but only as they come organically. The aforementioned 22-yard conversion of that second-and-16 is one example, of course. But there was another play six snaps later that was meant to be a shot, and instead became an example of Bortles growth. It was third-and-three, with 1:11 left. “We were going to try to take a shot to DJ Chark,” Hackett said. “He ran a post—I thought [New England’s Stephon] Gilmore did a really good job covering it—and Blake casually went back around, didn’t worry about it being a four-minute situation. It was just third down, and he just flipped the ball over there to Corey [Grant], and Corey did what Corey does.” The play went for five yards and a first down, sealing the win. Grant, Hackett told me, was the fifth receiver in Bortles’ progressions on that play. All that was left after that one was a single kneel-down. And when it was over, there was plenty to take away. The Jaguars manhandled the Patriots at the line of scrimmage. Rob Gronkowski was held to 15 yards on two catches. Jacksonville’s young receiver group showed its potential, with sophomore Keelan Cole making one of the craziest one-handed catches you’ll see—“I’m not gonna lie,” said Hackett, “it was hard to call a play after that, I was so jacked up”—as part of a 77-yard afternoon. But more than anything, you saw a quarterback who too often hasn’t lived up to his promise absolutely looking like a third overall pick. “Everybody has written the story on him—they’ve decided what they think,” Hackett said. “He’s been through a whole bunch, going on his fifth year. How I look at it, he’s had a bunch of different coaches, a bunch of different systems. This is him going into his second year in the same system. He’s very confident in himself, he always has been, he’s an aggressive person naturally. And he doesn’t listen to the outside noise. Whether it’s positive or negative, he never has. This much is for sure: If there’s more of that coming, the Jaguars will take it. Eleven quarterbacks threw for more than 300 yards on Sunday, but there’s no question who the shining star of Week 2 was, and it’s the same guy who was a revelation in Week 1—22-year-old Chiefs QB Patrick Mahomes. And I’m saying that because not just from watching him, but from what I’m hearing about him. Sunday’s game was significant in that the Steelers have been a thorn in Kansas City’s side, and a reason for a retooling this offseason. Andy Reid was 1-4 against Pittsburgh since arriving in K.C. in 2013, and the last couple of losses convinced the Chiefs brass that they needed to build a tougher and sturdier roster, which is part of what led to the defense being overhauled in March and April. The Chiefs did get over the hump on Sunday. But it wasn’t because of all those changes. More so, it was about the change under center. Mahomes, as he did against the Chargers in Week 1, made it look easy against the Steelers, smoothly connecting on 23-of-28 for 326 yards and six touchdowns without a pick. He now has 10 touchdown passes for the season, more than any other quarterback has ever had through two weeks in the Super Bowl era. I’d encourage you to take a look at the story we did last week with Mahomes—he detailed a number of plays from the Week 1 win over the Chargers that showed his growth as a passer, and one he’d like to have back, and explained how baseball taught him to make some of the trick-shot throws he does. And I’d warn you too, that there will be an adjustment coming from opposing defenses that may cause Mahomes to stumble a little. It happened to Carson Wentz two years ago, when opponents started sitting on the short stuff and forcing the then-Eagles rookie out of his comfort zone. It happened with Marcus Mariota the year before that. The good news is that Mahomes is ready for that, too. That cat-and-mouse game ahead should be a blast to watch. The Packers thought it was over when rookie corner Jaire Alexander picked off Kirk Cousins with 1:37 left in Sunday’s showdown with the Vikings. Referee Tony Corrente and crew had other ideas, throwing a flag on Green Bay linebacker Clay Matthews for roughing the passer that seemed dubious at best. On the play, Matthews came shoulder first into Cousins’s midsection. At first it looked as if the flag was for violation of the new so-called Aaron Rodgers Rule (born of Vikings linebacker Anthony Barr’s season-altering hit on Rodgers last October), which prohibits defensive players from landing on quarterbacks with most of their body weight. But according to the pool report from ESPN.com’s Rob Demovsky, it was actually for violation of a rule prohibiting scooping the quarterback off his feet. Demovsky: Tony, can you explain the penalty on Clay Matthews and what you saw there on the late hit? Corrente: That was the play in the fourth quarter. Corrente: When he hit the quarterback, he lifted him and drove him into the ground. Demovsky: Is that enforced under the new helmet rule? Corrente: Not at all. It has nothing to do with the rule of full body weight. It has nothing to do with helmet-to-helmet. He picked the quarterback up and drove him into the ground. Demovsky: What could he have done differently on that play? Corrente: Not picked him up and drove him to the ground. If you go back and look at the play, Matthews comes in neither high nor low. The only reason Cousins leaves his feet seems to be because he had forward momentum following through into his throw, with the Packers linebacker connecting in the midst of that follow through. The end result? After the penalty, Cousins took eight plays to navigate the 60 yards left, throwing a touchdown pass to Adam Thielen, then a two-point conversion toss to Stefon Diggs to tie the game and force overtime. The extra 10 minutes settled nothing, the teams went home with a tie, and there are certainly scenarios to consider that could cost the Packers four or five spots in the seeding relating directly back to this weekend. I personally hate the call, and not because I’m trying to be a tough guy. I hate the call because I don’t know what Clay Matthews was supposed to do there, no matter what Corrente thought he might be capable of. The Browns have been in touch with potential suitors for troubled receiver Josh Gordon in the 24-plus hours after the team’s announcement that they were planning to release him on Monday—which was a de facto “make us an offer” smoke signal to the rest of the league. And as much as getting a return might be nice, I think controlling Gordon’s destination is as important to Cleveland. • There were signs of trouble early in the summer, with rumors buzzing before the July 4 holiday that he’d slipped up. That was followed by Gordon staying away from the start of Browns training camp, a move that came as a surprise to some on the Cleveland coaching staff. • Gordon’s final days in Cleveland were just as strange. On Friday he tweaked his hamstring doing a promotional shoot. The team found out about it on Saturday, after Gordon showed up to work late. • Gordon is one failed drug test from banishment from the league. • The one year Gordon stayed out of trouble was 2013—and he caught 87 passes for 1,646 yards and nine touchdowns. That year, then-Browns CEO Joe Banner hired performance psychologist James Bell and Cleveland Clinic psychiatrist Mayur Pandya to help with troubled players, and the two were vital in Gordon staying on track. • Gordon is seen as easily influenced, which is why the Browns have tried as much as possible to get him around a brother of his who was living in California and is seen as a positive force in his life. • Those who know Gordon say his substance abuse problem stems from deep insecurity and self-esteem issues. No one seems to think he’s a bad guy. That’s why so many people are rooting for Gordon to make it. It’s hard to find someone who’s played with or coached him who isn’t. There’s clearly a lot to deal with here. That said, Gordon would come cheap, probably for a low-round pick and at less than $1 million for the rest of the year. And the one thing that always affords guys second chances in the NFL—talent—is something Gordon very clearly has. So stay tuned on this on Monday. I’d heard enough questions about Matt Ryan’s arm strength in the Thursday night opener, from inside the league and out, to compel me to ask the question of the Falcons quarterback on the phone after Atlanta’s 31-24 win over Carolina on Sunday. Was something wrong in Philly? There’s no doubt about that. Ryan threw for 272 yards and two touchdowns on 23-of-28 passing as the Falcons bounced back from a bad opener in Philly, and maybe, just maybe, created some optimism for embattled offensive coordinator Steve Sarkisian’s unit. And the team could use it. The tough loss in the opener was followed by even tougher news that both middle linebacker Deion Jones and strong safety Keanu Neal were headed for injured reserve—delivering a pretty heavy blow to a talented young defense that seemed to be on the verge of turning the corner. That, of course, put the onus back on the offense to pick up the slack. “You never want to see guys go down like that, especially leaders and such productive players for us,” Ryan said. “But I think one of the things that helps is Dan [Quinn] does such a great job of guys to come along, developing them. We spend a lot of time in the offseason with the young guys, getting them up to speed. I thought our guys that came in and replaced them today did a nice job. It’s not a totally unfamiliar spot for the group, either. Over Quinn’s first two years, Ryan, Julio Jones and company carried the Falcons through a rebuild on the other side of the ball. It worked, too, with Kyle Shanahan’s offense taking off in Year 2 and the driving the team all the way to the Super Bowl. That offense set a high bar. But there’s at least hope—and it showed up late in this game—that Sarkisian will see a second-year leap like his predecessor did. “I thought he did an excellent job on our last touchdown drive,” Ryan said of the 7-play, 75-yard possession. “He did a great job setting things up, calling things out of certain personnel groupings that we worked through the entire game. Knowing we’ve worked on those things when we get the looks, and just his timing on the calls on the last drive for the touchdown was great. It looked different, too, than it did 10 days earlier, which in this case was a good thing. Bills LB Lorenzo Alexander on veteran cornerback Vontae Davis’ retirement from football in the middle of the Chargers-Bills game. This is my 14th year covering the NFL, and I’ve seen a lot, but this is a first. And Alexander had a right to be pissed off. Davis, who was in his 10th season and signed with Buffalo as a free agent last spring, released a statement later that didn’t really apologize to his (former) teammates for abandoning them in the midst of a game. An apology absolutely needed to be in there. Just a weird situation in general, even by NFL standards. The best part of this clip is that Ryan Fitzpatrick is deadpan the whole time—“We just gotta stay humble.” OK, that’s not really the best part. The best part is his outfit.” More on this important story here. Dolphins wide receiver Kenny Stills is one of two players, along with teammate Albert Wilson, who is still kneeling during the national anthem, and he’s said, repeatedly, that the gesture is not about the anthem itself, or the military. This week Stills used his time off to visit veterans with health-care needs in South Florida. “To see and know that veterans understand what we’re doing and why we’re doing it,” Stills told the Palm Beach Post’s Joe Schad, “we’re not against them. And it’s never been about that. I think that’s really important, and it means a lot to them. Like I said before, this has never been about the military or the flag or the police.” We saw a lot of similar situation on Tuesday from players involved in the social-justice protests, and I don’t think it was a mistake that their actions were promoted by their teams and the league. To me it’s a sign that the union and league are finding solutions behind the scenes as they try to move the ball forward on this issue. 1. Iowa State coach Matt Campbell is firmly on the NFL’s radar and could wind up getting calls in December and January. A GM raised his name to me over the summer, and another exec brought him up on Sunday morning after his Cyclones hung tough against the fifth-ranked Oklahoma Sooners. During their school visits, NFL scouts have seen the smooth operation the 38-year-old Campbell runs, and he’s shown a propensity for getting more out of less first at Toledo and now in Ames. 2. Not a banner Saturday for the top quarterback prospects, as Oregon’s Justin Herbert and Auburn’s Jarrett Stidham threw multiple picks, and Missouri’s Drew Lock was up-and-down in a win. Scouts have been waiting for someone to emerge from the group, and it hasn’t quite happened yet. It’s worth mentioning: Those who’ve been through Eugene on school calls have left very impressed with Herbert. 3. Speaking of quarterbacks, Vanderbilt’s Kyle Shurmur, son of Giants coach Pat Shurmur, was awfully impressive in defeat in South Bend. The Commodores fell 22-17, but Shurmur, a senior, kept his team in the game down the stretch, finishing 26-of-43 for 326 yards, a touchdown and a pick. 4. The NFL’s reaction to the Big 10’s bad day—Wisconsin losing to BYU, Nebraska to Troy, Rutgers to Kansas, Northwestern to Akron and Maryland to Temple—was pretty much what you’d expect it to be. And it doesn’t change the notion that they had that Ohio State and Penn State are a cut above the rest of the conference talent-wise. 5. I was very, very impressed watching TCU’s Gary Patterson—who really is that school’s Bear Bryant—coach in primetime against my alma mater on Saturday. And when I asked around, one AFC exec responded, “It’s about time he’s in the conversation for best coach in college football.” So the natural next question: Could it work in the NFL? He’s 58, so that ship has probably sailed. But even taking that out of the equation, the guys I asked said he’d probably have a difficult time because he’s demanding and tough, which has worked with hungry overlooked kids. There’s a reason TCU shies away from superstar recruits, and that reason explains where Patterson might have issues in the pros. 6. Speaking of that game, it was the final one for Ohio State’s Ryan Day as interim coach—Urban Meyer is back now—and I thought what he said about Buckeyes defensive coordinator Greg Schiano was interesting: “What Greg Schiano’s done for me in the last month is something I’ll never forget. He’s the classiest person I’ve ever been around in the coaching profession, the way he’s handled himself, helping me along the way, counseling me on day-to-day stuff.” Schiano’s had image issues over the last few years, but he also has a lot of support from people who’ve worked with him or know him, and this is more evidence of that. 1. Chalk one up for the new Dolphins culture—coach Adam Gase conceded to me last week that his 2017 team probably wouldn’t have handled the double rain-delay opener as well as the ’18 Dolphins did, and this Sunday gave the team another one of those “we might not have pulled this off last year” moments. One reason Gase overhauled the locker room this offseason (Ndamukong Suh and Jarvis Landry out; Frank Gore, Josh Sitton, Danny Amendola, Albert Wilson in) was because of what he saw last December—the team beat New England on a Monday night, only to lay an egg six days later in Buffalo. Suffice it to say, in jumping out on the Jets early at MetLife Stadium, and then holding them off late, these Dolphins, now 2-0 and leading the AFC East, showed they could handle prosperity a little better than last year’s gang. 2. While we’re on the Dolphins, we have to mention Frank Gore moving to fourth on the NFL’s all-time rushing list—he passed ex-Jet/Hall-of-Famer Curtis Martin on Sunday. Of the 12 players directly behind Gore on the list, 10 are enshrined in Canton, an 11th (Adrian Peterson) is a sure thing to get there, and the 12th is a maybe (Edgerrin James). So I called the man who drafted Gore into the league 13 years—and of course Scot McCloughan, who texted with Gore on Sunday night, didn’t hesitate when talking about about his Canton candidacy. “No doubt about it, he’s a Hall-of-Famer,” said McCloughan, who was the Niners’ GM in 2005 when he drafted Gore in the third round out of Miami. “He’s all football, through and through. Still to this day, he cries when they lose. That’s how much it means to him. This guy’s not as talented as some others I’ve been around, but he’s more of a football guy. Guy’s a stud.” Remember, when McCloughan drafted him, Gore had two reconstructed shoulders, two reconstructed knees and a bad 40 time. He had to have conviction then. So it’s no wonder he has conviction now. 3. One of the biggest disappointments of Week 1 was a Saints defense that looked loaded going into the season and listless once it started. A 21-18 New Orleans win over Cleveland on Sunday was a modest step forward for a unit that believed it boasted two Defensive Player of the Year candidates (Cam Jordan, Marshon Lattimore) and a few guys set to break out (most notably safety Marcus Williams) coming into the year. “Week 1 gave you the look at when everybody’s not on the same accord, these are the things you have to look back on,” Jordan told me. “So Week 2 we did exactly what we needed to do to gain confidence. That being said, we’re still building. … It’s going to be a hard battle uphill, especially after what we had last week. But we’re on the right steps. For us to contain an offense with Jarvis Landry, with Tyrod Taylor, with Carlos Hyde, that’s a pretty solid one. Had they had Josh Gordon, that’s a deep-threat receiver. But apparently, so is this Callaway kid, right? It’s something we’re going to have to continue on because next week we’ve got Julio Jones, and the young kid [the Falcons] drafted, Calvin Ridley, and Mohamed Sanu. It’s gonna put it on us.” Saints-Falcons be a good referendum on both groups. 4. We went to a couple of special teams coaches on Sunday night looking for an explanation for the kicking fiasco of Week 2. So let’s start with the two most glaring cases from Sunday—Cleveland’s Zane Gonzalez (among four missed kicks, he botched a go-ahead extra point in the fourth quarter and a potential game-tying field goal after that) and Minnesota’s Daniel Carlson (three missed field goals, two in overtime). One special teams coach pointed to roster moves in each case. The Browns actually picked Gonzalez over Cody Parkey at the 2017 roster cutdown, and Parkey went on to put together a very solid year in Miami after that, then signed a four-year deal with the Bears. The Vikings, meanwhile, switched punters, bringing in Matt Wile on Sept. 2. That also meant switching holders, which can mess with a rookie like Carlson. And then there’s an overarching element that touches these two kickers and all the others: When the PAT was basically a 20-yard field goal, kickers would use it to work through their kinks in game conditions, and they don’t have that anymore. 5. The Giants spent a lot of capital to fix that offensive line of theirs. Nate Solder is on a four-year, $62 million deal. Will Hernandez cost them the 34th pick. And Ereck Flowers and Jon Halapio are making those investements not matter much. New York averaged a grand total of 2.1 yards per rushing attempt and Eli Manning was sacked six times on Sunday night. That calls into question the win-now move to draft Saquon Barkley second overall, over Sam Darnold in April, a decision that will probably only be debated for the next 30 years or so in New York. (Credit to a Dallas defensive line with a ton of potential, too). 6. I liked the undermanned Bills’ fight on Sunday against the Chargers. They could’ve easily folded up the tent (and yes, one of the 46 guys who dressed actually did) down 28-3, but they made the final score respectable in the end, which is a credit to what Sean McDermott has built there over the last 20 months. This year was always going to be rocky. There’s more than $50 million in dead money. Only five pre-McDermott Bills draft picks remain on the roster. But a rip-the-band-aid-off season was necessary in Buffalo, and so it’s good that the brass there has the credibility of a playoff season in its back pocket to keep the players engaged through what’ll be a long few months. 7. My underrated play of the day—Aaron Rodgers escaping the rush on third-and-six with 2:23 left in the game, on a bad wheel, to throw the ball away. If he’d taken the sack, and Everson Griffen was all over him, it might have knocked Green Bay out of field goal range. Instead, Rodgers saved the yardage, and Mason Crosby drilled a 48-yarder on the next play to make it 26-21. Without Rodgers making that heads up play, one that shows up looking like a whole lot of nothing in the stat sheet, the Packers might have lost in regulation. 8. Case Keenum is 12-1 in his last 13 regular season starts, and 13-2 if you include playoffs. And while I’m not going to give him all the credit, Keenum has come through when the Broncos have needed him. Last week he put together a seven-play, 75-yard drive in the fourth quarter to give Denver the go-ahead touchdown. This week, 10-play, 62-yard march set-up Brandon McManus’ game-winning 36-yard chip shot. 9. For what it’s worth, Derek Carr was pretty good in defeat Sunday, going 29-of-32 for 288 yards and a touchdown. And Amari Cooper had 10 catches for 116 yards. Yes, the defense needs work. Yes, that’s partly Jon Gruden’s doing, given the Khalil Mack trade. But maybe we should hang around a little while before dismissing Chucky as a dinosaur? 10. Damontae Kazee’s ejection for his hit on Cam Newton on Sunday—which was an easy call, and the correct one—brought me some clarity on all the fuss over the rules changes. We were all worried about the helmet rule. And as far as I can tell, it hasn’t created nearly the problem that the body-weight rule has. The reason? I think it’s because it’s been a long time since coaches were teaching the kind of hitting that the helmet rule is meant to eliminate, while the body-weight rule requires a very real adjustment to the way things have been done recently. Sept. 3: Named Jets starting quarterback. Sept. 10: Regular season debut at Detroit. Sept. 16: Home opener vs. Dolphins. Sept. 20: Thursday Night Football at Cleveland. In that span are three defensive coaches—Detroit’s Matt Patricia, Miami’s Matt Burke and Cleveland’s Gregg Williams—who like to throw plenty at the quarterback. Because of the kind of kid he is, I think Darnold will come out better for it. But man, that is a challenging way to enter the league. A week to prepare for a road game in Week 1, then consecutive games on short weeks. Oh, and as for tonight, give me Bears 24, Seahawks 20.